THIS CHAPTER DESCRIBES THE INTERNATIONAL AND DOMESTIC USE OF LIFE CYCLE APPROACHES BY THE PUBLIC SECTOR , PRIVATE SECTOR , INTERNATIONAL ORGANIZATIONS, NON-GOVERNMENTAL ORGANIZATION (NGOS) AND ACADEMIA (SEE FIGURE 4). THE EXAMPLES INCLUDED BELOW WERE CHOSEN BASED ON THEIR RELEVANCE TO CANADA BECAUSE OF THEIR ECONOMIC AND ENVIRONMENTAL IMPLICATIONS, OR TO ILLUSTRATE BEST PRACTICES THAT COULD BE INCOR PORATED INTO FUTURE GOVERNMENT OF CANADA POLICIES AND PROGRAMS. EXAMPLES OF CURRENT GOC POLICIES AND PROGRAMS THAT INCORPORATE ASPECTS OF LIFE CYCLE APPROACHES ARE ALSO INCLUDED. THEY ILLUSTRATE THE SPORADIC NATURE OF ITS USE BUT ALSO SHOW THAT THE GOC HAS A PLACE FROM WHICH TO START SHOULD IT CHOSE TO PURSUE LIFE CYCLE APPROACHES IN A MORE DELIBERATE AND COORDINATED FASHION. WE WILL ELABORATE ON SOME OF THESE EXAMPLES IN LATER CHAPTERS OF THE REPORT. Life Cycle Approaches are increasingly used around the world with the European Union (EU), United Nations (UN), Society for Environmental Toxicology and Chemistry (SETAC), multi-sectoral industry groups (e.g., the Sustainability Consortium) and multinational companies leading the way. Several international and multicountry initiatives have driven this adoption, and Canada needs to keep pace with this global trend. Both specific and high-level drivers are increasing the adoption of Life Cycle Approaches across the world. High-level drivers include issues discussed in Chapter 1, such as population growth, resource conservation, and ecosystem impacts of production. Specific drivers include market factors, trade issues and regulations. Market factors encompass the growing demand from many sectors, including the electronic, retail, apparel and green building sectors, for life cycle data and information along their supply chains. Firms and suppliers are increasingly expected to incorporate or demonstrate sustainability in their own production and consumption of goods and services. Trade issues include effective application of new trade barriers from jurisdictions with life cycle requirements on products sold in their country, province or state. Regulatory drivers comprise such things as the incorporation of life cycle information in government policy formation and procurement. More details regarding these drivers will be provided in Chapter 4. EU member states are also creating policies and programs that include Life Cycle Approaches. One such example is France’s La Grenelle 2 Act, as illustrated in the case study below. 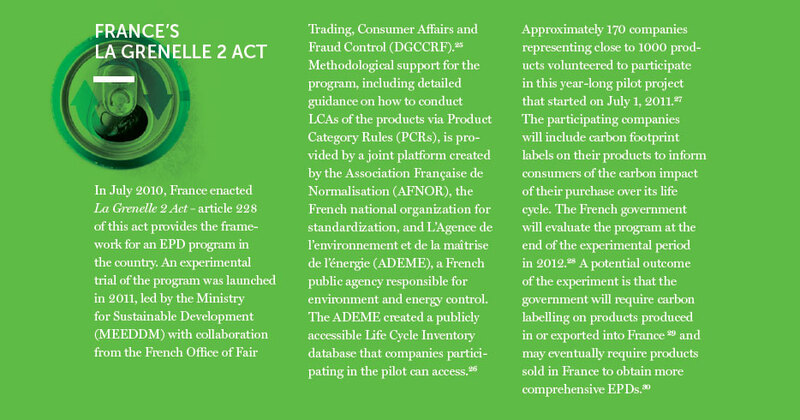 In its current pilot phase, this act encourages the use of LCA to create Environmental Product Declarations (EPDs) that detail carbon impact of products sold in France. The EU and its member states are leading the way in the use of Life Cycle Approaches in public policies and programs, although many other countries around the world have adopted aspects of this approach, including Japan and the United States (U.S.). Two life cycle-based fuel standards have also been created by governments in the U.S. – the EPA’s Renewable Fuel Standard (RFS2) and California’s Low Carbon Fuel Standard (LCFS). These standards are discussed in more detail in Chapter 4. Several global networks exist that focus solely, or in part, on advancing the use of Life Cycle Approaches in the industrial sector. Most notable are the Sustainability Consortium and the Consumer Goods Forum. Formed in 2009, the Sustainability Consortium focuses on measuring and reporting product sustainability over the life cycle through the creation of standards and tools.33 The development of a Sustainability Measurement and Reporting System is the focus of much of the Consortium’s work, which will provide guidance on the collection and dissemination of LCA-based information of a product over its supply chain.34 Membership in the Consortium includes large multinationals such as Walmart, DELL, Kimberly-Clark, 3M and Kellogg’s. Several government agencies (e.g., U.S. EPA) and NGOs (e.g., World Wildlife Fund) are also members. The Consortium is co-managed by the University of Arkansas and the University of Arizona. It demonstrates growing private sector interest in this field. The Consumer Goods Forum represents over 650 retailers, manufacturers, service providers globally (worth over EUR 2.5 trillion in annual sales).35 Their Product Sustainability Measurement Working Group focuses on standardizing product LCA measurement approaches. The forum collaborates with the Sustainability Consortium and several European initiatives on this. Many members of the forum have operations in Canada, including those on their Global Sustainability Steering Committee such as Sobeys, Walmart, Unilever, Nestle, Coke, Pepsi, Kraft, Kellogg’s, Proctor & Gamble, Danone, General Mills and Sara Lee. Decisions made on the use of LCA at this forum may have repercussions for Canada because of the Canadian operations of the multinational member companies. Several global networks exist that focus solely, or in part, on advancing the use of Life Cycle Approaches in the industrial sector. [††] SMEs are companies that have 1-499 employees.